When Leo, (our eldest) was really little, I was obsessed with his sleep. I wanted to teach him to fall asleep and stay asleep by himself, but it seemed like the only way of doing that involved tears. When he was ten weeks old we went to a sleep school and came home and tried to pat and shush, but it just didn’t work for us. One very memorable time all three of us ended up in tears and we knew it wasn’t working. We were sleep-school drop-outs. During that time when all I thought I wanted was for him to learn to sleep by himself – out of our arms, out of our bed, as the books said – Jeff said something that’s always stuck in my mind. “Sometimes you’ve got to be kind to be kind”. It totally blew my mind. That simple truth cut through all the conflicting emotions I was feeling. My love for Leo, my desire to control him, wishing for a full night’s sleep, wanting to do the ‘right’ thing (whatever that was), wanting to hold him when he cried… All the stories I was telling myself just melted away with those simple words. My only duty was to be kind to him and kind to myself. Whatever that spirit of kindness led us to was what we needed to do. This approach meant that my way wasn’t going to be the same as anyone else’s (which defuses the need to judge others for how they tackle their own parenting challenges). It would be our way. And if our situation changed or something stopped working for any of us then we could change how we did things. Our way involved one of us being with him until he fell asleep, and his sleeping in our bed. Time passed and I came to cherish that time spent together. We fed, bounced, rocked, drove and walked him to sleep – making it up as we went along. He started sleeping through the night at around two years old. From the age of two to three, the only way to get him to nap was to drive around with him in the car or put him in the stroller and walk around fast along not very interesting streets. Then at about three he stopped having a day-sleep altogether. At six, he still sleeps in our room on a mattress next to the ‘big bed’ and one of us lies with him while he goes to sleep. This suits us fine but I know it wouldn’t suit a lot of other families. When our second son Clem came along four and a half years after Leo, we were much more chilled out when it came to sleep. There was a bed reshuffle and for the first year, Jeff and Leo shared a bed and baby Clem and I shared a bed in another room. At the moment, all four of us sleep in the same room with an extra mattress on the floor. Instead of working on getting Clem to nap in a cot, one of us wore him in a carrier for all his naps up until he was about 17 months old, which is why I am wearing him in lots of photos of me painting the illustrations. We have tried not to give any specific advice in the book about how you should parent because we believe that everyone’s ‘how’ is unique. DO WHATEVER WORKS FOR YOU! 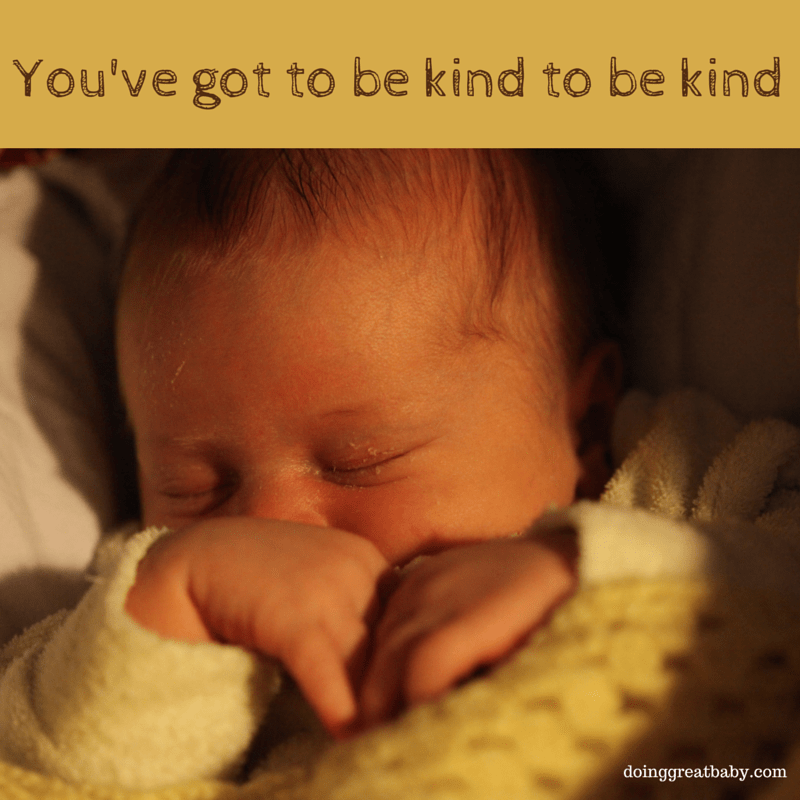 I hope that our book is infused with the message of being kind to both yourself and your baby. If you are interested in reading more about safe co-sleeping, see James McKenna’s website: Mother-Baby Behavioural Sleep Lab. Also this about bedtime with an older kid is really sweet. Beth, I remember you sharing Jeff’s lovely saying about kindness when I was wrestling with the concept of self-settling. The other piece of advice from you that really stuck with me is that babies change every few months, and you can adapt your approach as they change, no need to agonise over forming bad habits or if what you’re currently doing is sustainable. I am glad I embraced co-sleeping, carrying, cuddling and breastfeeding to sleep early on and let go of the struggle. Everyone has to work out their own way, but the more support we all have to trust our instincts – and trust our babies – the happier we’ll all be. Thanks for your comment Vanessa! I found agonising over forming bad habits much more torturous than sleep deprivation. I love it when women talk to each other about stuff like baby sleep and you find out the full range of normal – and the (in retrospect) hilarious stories of the desperate things people do to help their kids sleep. If we can give ourselves a break and just do whatever’s working the more the better.